This week’s tax reform briefing will be Friday, November 17th at 2:00pm ET and will feature Kevin Hassett, Chairman of the Council of Economic Advisers for the Trump Administration. Dial-in information and instructions are listed below and we look forward to hearing from you. Instructions: Dial the conference phone number. When you’ve entered the call you will hear music until the conference begins. Our guest will give an update on tax reform, then we’ll open it up for questions. This past Thursday, the Senate Finance Committee released its tax bill, and we have provided analysis below not only of what is in the Senate bill, but also a summary of the differences between the Senate bill and the House bill. Overall, we remain encouraged that Republicans in Congress are tackling tax reform, and that we have a real shot of establishing a tax code that will be simpler, flatter, and fairer. A full repeal of the SALT deduction (the state and local tax deduction). Unlike the House plan, which would allow people to deduct up to $10,000 of taxes paid on property to state and local entities (while eliminating people’s ability to deduct state and local income and sales taxes paid), the Senate version goes one step further and eliminates all SALT deductions. The corporate tax rate would be reduced to 20% from 35%, and the cut would be permanent. Unlike the House version, which would put the corporate tax rate reduction into effect in 2018, the Senate version waits until 2019. The mortgage interest deduction is maintained at the current tax code’s cap of $1 million of debt, whereas the House bill would reduce that amount to $500,000 of mortgage debt. Like the House version, the Senate version doubles the exclusion amount for the estate tax. Unlike the House’s version, however, the Senate version does not gradually repeal the estate tax. For multinational corporations, their accumulated offshore earnings would be taxed at 10 percent for cash holdings and 5 percent for non-cash holdings. This contrasts with the House version, where offshore earnings would be taxed at 14 percent for cash holdings and 7 percent for non-cash holdings. Americans are ready for tax relief and job growth. Our economy is in desperate need of a boost, and reforming the tax code is the best chance we have of reenergizing our economy. Last week, we heard from Congressman Steve King on a briefing on Thursday. Congressman King explained two options for improving the tax reform bills. The first would be an amendment to repeal the individual mandate in ObamaCare. That mandate alone is very costly to families, so eliminating it would provide much-needed relief in families’ budgets. The second proposal Congressman King discussed is a proposal he has authored, the New IDEA Act, which could be added as another amendment to the bill. His proposal is a commonsense idea that would not allow companies to deduct their expenses (wages and benefits) for illegal immigrants. This is an important proposal that not only would allow us to get serious about our nation’s immigration laws, but would also save money. Please call both of your U.S. Senators and and your U.S. representative urge them to support tax reform. You can reach them by dialing the Capitol Switchboard at 202.224.3121 and asking for their offices. 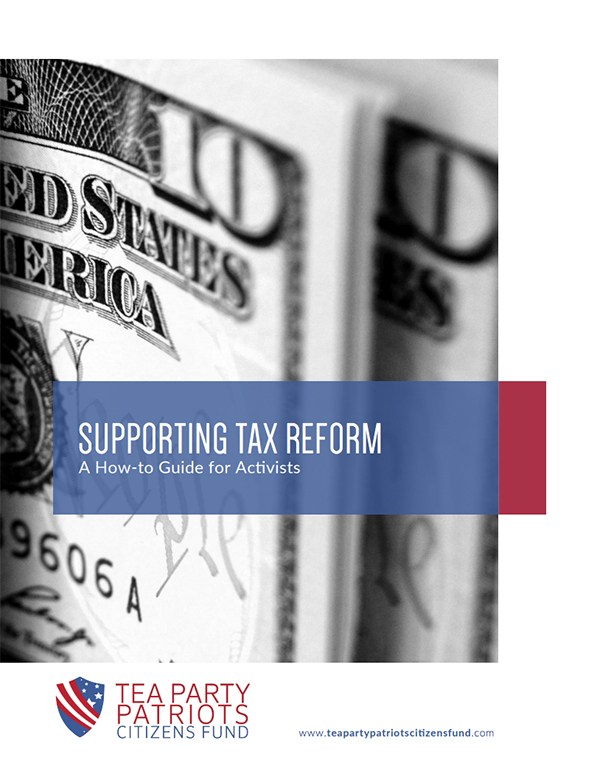 Download our Tax Reform How-to-Guide below and sign our tax reform petition. Our petitions are the easiest and most effective way to make your voice heard. Read our talking points below and use them when calling Congress. 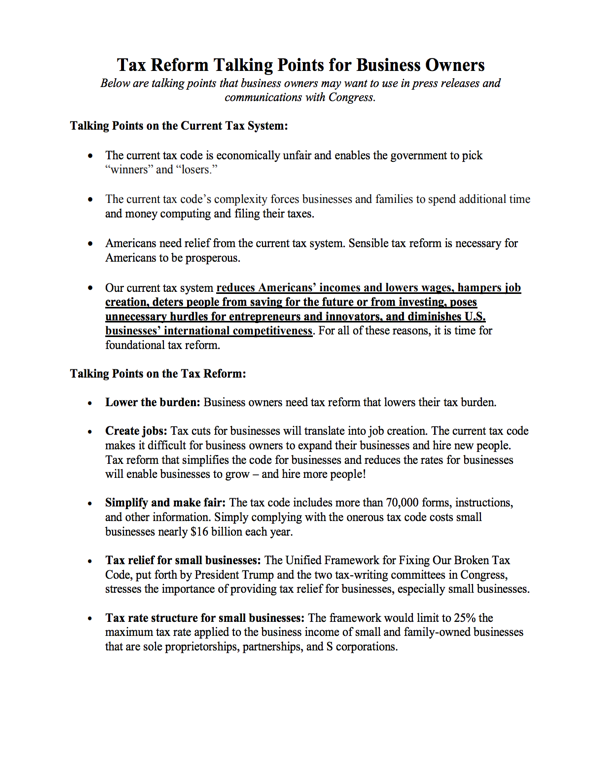 Also be sure to check out our new talking points for business owners. 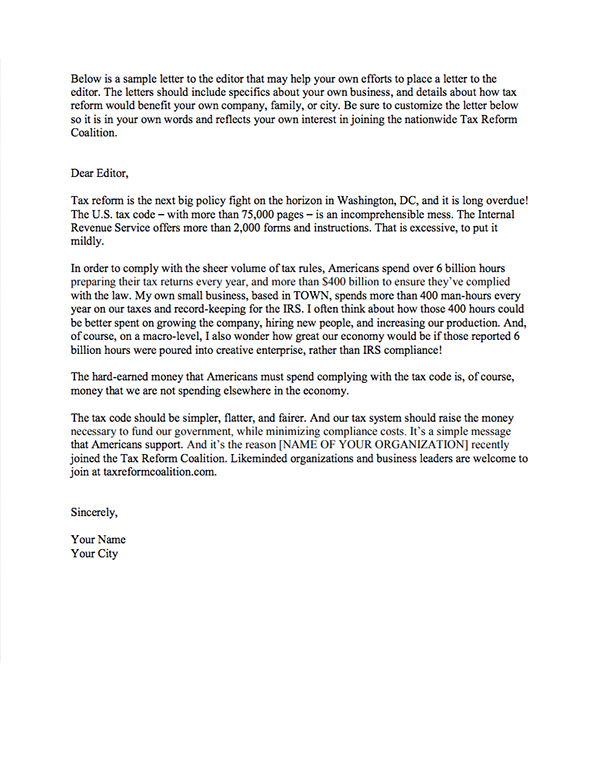 Use our sample press release to announce you’ve joined the tax reform coalition. Use our sample letter to the editor to write a letter. Let us know when you get it published. Please check out FreedomWorks’ tax reform page. Please share your tax reform story with us. How you would benefit from tax reform? Consider hosting a house party. We have house party kits available now, and we will ship one to you so you can host an effective house party. 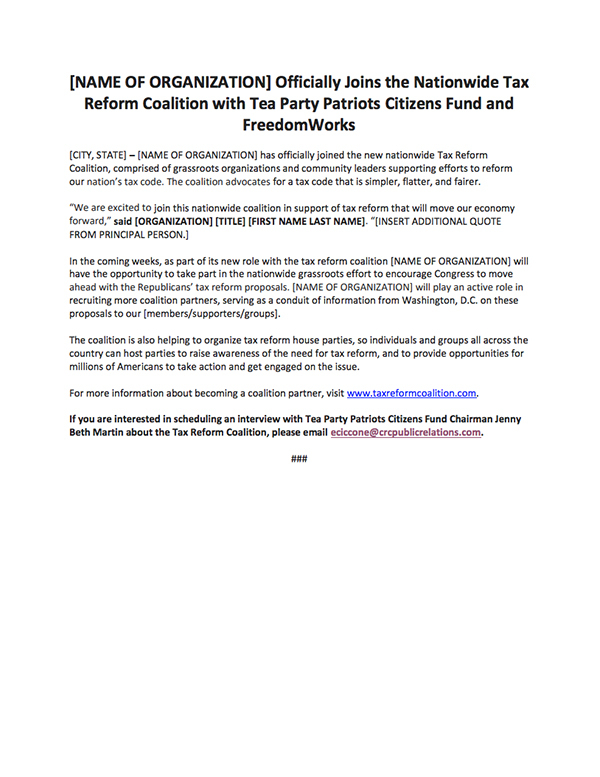 Help us grow the tax reform coalition by inviting others to join. The U.S. tax code is a complicated mess and a drain on the economy. The House and Senate tax bills address many of the most serious problems plaguing our tax code, including excessively high tax rates for corporations and incentives for businesses to move abroad. Both tax bills include much-needed simplifications, especially eliminating the SALT (state and local tax) deductions for sales and income taxes, and, in the Senate version, even state and local property taxes.